This pair seems to have found a floor at the bottom of its descending triangle pattern on the long-term time frames, probably gearing up for another test of resistance. 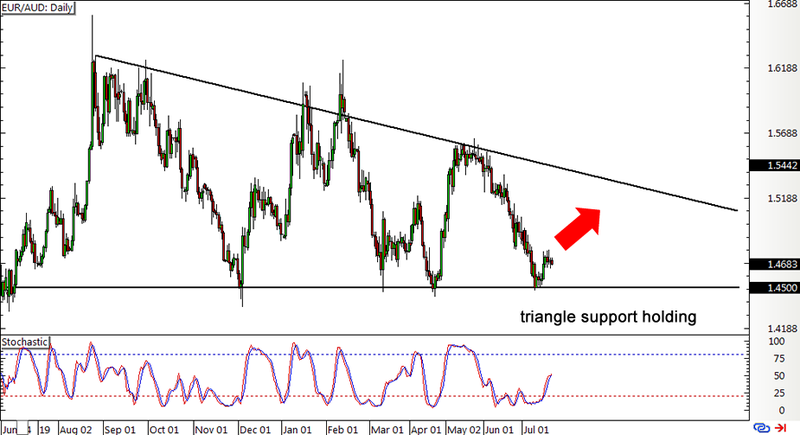 As you can see from EUR/AUD’s daily chart below, support at the 1.4500 major psychological mark held recently. 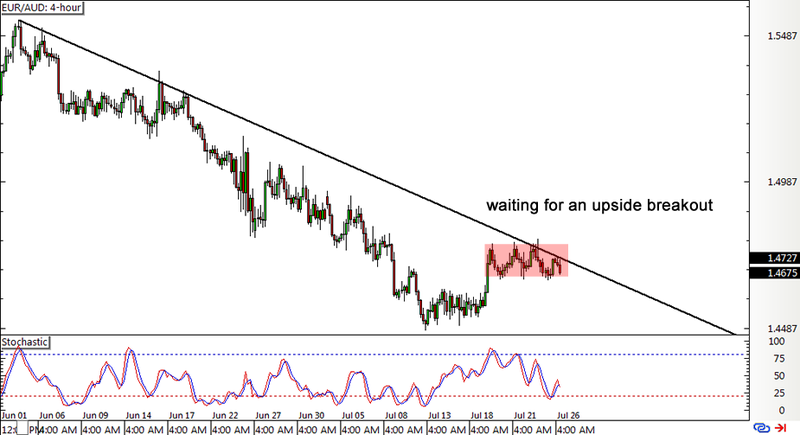 Stochastic is on the move up, which suggests that buyers are taking control of price action and might be strong enough to push the pair up to the 1.5300 area. Zooming in to the 4-hour time frame shows that price is still consolidating below a short-term descending trend line so I’ll wait for an upside breakout before hopping in. I’m thinking that this week’s Australian quarterly CPI report could be a catalyst for a break higher if the actual results fall short of consensus. If you recall, the RBA decided to cut interest rates earlier this year primarily due to weaker than expected Q1 CPI. As for the euro, data from the region has been upbeat so far, with the German Ifo business climate index posting a smaller than expected dip from 108.7 to 108.3 versus the projected fall to 107.7. German import prices and its GfK consumer confidence are still up for release tomorrow. I haven’t set any actual entry orders yet since I plan on watching the Australian CPI release first, but I’m considering going long above the 1.4800 major psychological mark with a wide stop below the long-term triangle support at 1.4500 and a profit target near the 1.5300 resistance.